Essential amino acids (EAAs), as the name implies, are essential because they can’t simply be made by your body like all the other amino acids can. Instead, you have to get them from your diet or other exogenous sources. Amino acids are the building blocks of protein, they are crucial in the synthesis of muscle growth and prevention of muscle catabolism as well as mental health. Despite all of the benefits of BCAAs, they alone are not effective at stimulating lean muscle growth. The best way to stimulate lean muscle growth and prevent muscle breakdown is to take a balanced profile where all 9 EAAs are present. 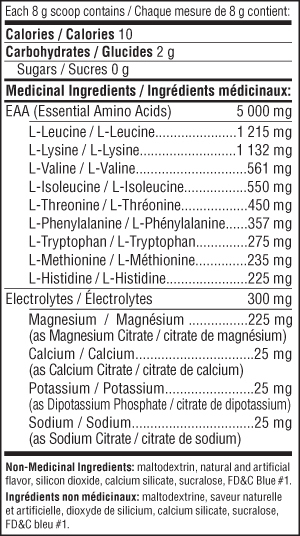 In order to maintain proper hydration during training, each scoop of Pure EAA contains 300mg of specific electrolytes. Retains, stimulates and builds muscle. Enhances mental focus during training. Enhances fat burning and glucose tolerance. Supports hormonal balance during intense training. Enhances endurance performance and decreases fatigue. Reduces muscle damage and soreness and increases recovery time. 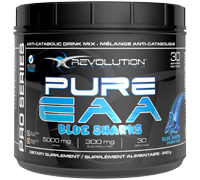 Mix 1 scoop (8 grams) of Pure EAA with 175 ml of water immediately before consumption. Sip throughout your workout or any physical activity. Because taste matters, Revolution Nutrition™ has earned a solid reputation as the best tasting sports supplements on the market today. We always take the time and effort to create flavors that are simply second to none so that each and every one of our consumers is always 100% satisfied.